If you're looking for an all-in-one, ready to gift graduation present, you are in the right place! Captured Wishes knows exactly how to celebrate an educational success! At this wonderful time in a young person's development, it can be hard to put your feelings into words. Whether the graduate is a son or daughter, niece or nephew, cousin or friend, it can be awkward to express exactly how you feel about this milestone. We've done it for you with this precious wish vessel. The three-panel verse card truly says it all - poignantly pitching a teary-eyed mess of loving phrases to show your pride and happiness. All you need add is your love and signature. Everybody knows somebody who's graduating this year, and it's very hard to tell them just how proud you are, and how much their future holds for them. No graduate will be unmoved by the love and best wishes captured in this little glass bottle that boldly boasts magical times ahead! Each Captured Wish vessel comes in beautiful custom packaging and includes a verse card which puts your thoughts and emotions into words for you. 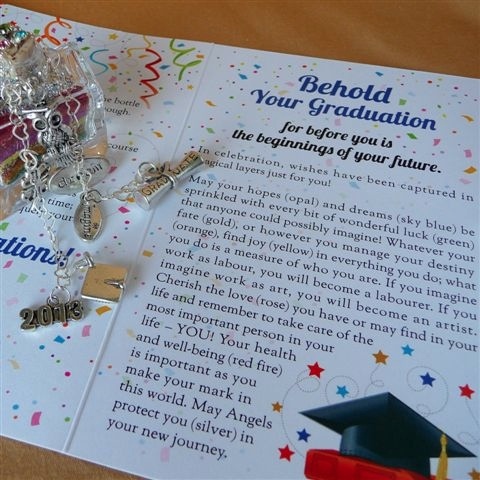 Particularly at Graduation, it can be tough to summarize everything this milestone represents; moving forward, growing into adulthood and developing into a man or woman of the world is an exciting journey. The bottle (40mm height including cork x 22 mm wide) contains Fairy Dust layers where each is explained by words sprinkled throughout the verse card. The graduate will be drawn into the undeniable feeling of warm personal attachment rising from this gift. This is a complete package - so personal, yet so easy. Arrives with verse card, gift box, and wish vessel. Ready to gift!